"Kids have summertime boredom...already? Help them beat it"
Our paperback, "The Over-Scheduled Child: Avoiding the Hyper-Parenting Trap" (formerly titled "Hyper-Parenting") explains why it is better -- in the short and long run -- for parents and kids alike to slow down, do less, and generally turn the volume down on family life. This book will make you feel happier about yourself as a parent, and calmer about your child as a person. Best of all? This is how to raise children who will succeed in life! Lists and schedules, meetings and appointments, that need to be the best no matter what - doesn’t it sound like your life? If it’s not - it’s your child’s. Parenting today has come to resemble a relentless To-Do list. Even parents with the best intentions strive to micromanage every detail of their kid’s lives and live in constant fear that their child will underperform in any area - academic, social, athletic. The fact is, parenting should not consume every last bit of our time, money and energy. It’s not good for us as parents, and it’s potentially dangerous for our children and their healthy development. 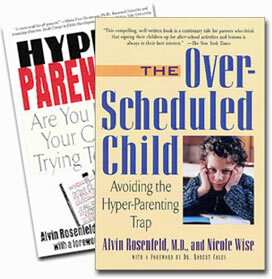 CLICK HERE TO READ THESE ARTICLES ON "HYPER-PARENTING"
This site and all its contents are protected by copyright laws, © Alvin Rosenfeld and Nicole Wise.